Rodriguez culminated his rally by pounding Couture into a verbal submission at the 3:04 mark of Round 5. 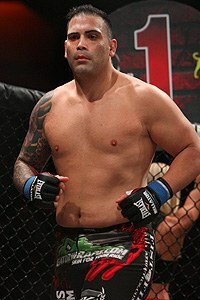 In the co-main event, future heavyweight champion Tim Sylvia won his UFC debut when Wesley Correia threw in the towel. BJ Penn and Caol Uno won semifinal bouts in a tournament to declare a new lightweight champion. Penn beat Matt Serra, and Uno defeated Din Thomas. Both fights ended with unanimous decisions. Gan McKee beat former headliner Pedro Rizzo when Rizzo’s corner stopped the fight after Round 1. Rizzo had taken a huge punch to the nose with 12 seconds left in the round. Phil Baroni knocked out former middleweight champion Dave Menne in 18 seconds. Before the pay-per-view went on the air, Matt Lindland beat Ivan Salaverry by unanimous decision, and “The Muscle Shark” Sean Sherk beat Benji Radach when the doctor stopped the fight at the 4:16 mark.